Congratulations to my good friends Jason and Tasha Pope on the birth of their second son yesterday! Wyatt was 9 lbs and 9 oz! Praise the Lord both baby and mother are doing well! I am pleased to announce that I will be participating in another Blog Hop. This tour is a little different than our last one. The theme of the blog tour is "THE NEXT BIG THING", in which we will be looking at blog's of author's who have a new book coming out. There is a special Q & A sheet which will be answered by each participating author, and I will have my answers posted for you, Lord Willing, nextg Wednesday, December 26th. 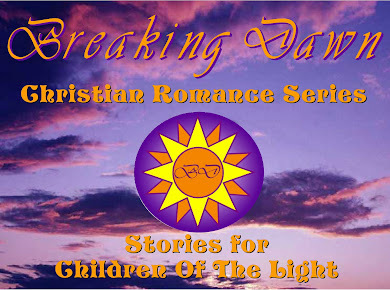 Yes, I know that this is the day after Christmas, but, this will be a golden opportunity to get the skinny on my current work in progress, Coming Home, the sequel to Book #1 of the Breaking Dawn Book Series: Stories for Children of the Light, Home.﻿ I would like to extend a special 'Thank You' to Author Brad Francis for inviting me to participate in this Blog Hoppin' Tour! It's Brad's Day today, and you can check out his blog by using the link on his name. So, don't forget to put me on your list of stops for the day after Christmas! Of course, do get up early and hit Wal-Mart and K-Mart for all of their after-Christmas Clearance Items. I know I'll be there! But, then when you've come home with all of your "treasures" for the new year, don't forget to sit down with a hot cup of Joe, and tune it! You don't wanna miss a thing! I've not read each and every book, but they are from Christian Authors. I've scanned the list, it is looks like there's a little something here for everyone: from Historical Romance to Guitar Instruction! ALSO: Please notice that some of these books have coupon codes that you must use during checkout to get them for free! Abbey Martin isn’t willing to be the kind of ‘player’ her boss wants her to be. When he threatens to not promote her because she refuses to get in ‘compromising’ positions, she quits. If a day can go from bad to worse, it does for Abbey. She runs into Bruce Harrington on her way home—literally. Bruce Harrington was on his way to a very important meeting. That was until a raving lunatic with brown, bouncy hair spiraled towards him in her car and then on foot. Maybe he should count it a blessing that when she sent him cascading over the side of the embankment—he wasn’t in his car. To make amends for causing Bruce to break a leg, Abbey becomes his chauffeur and helpmate until he recovers. When his cast is about to come off he has to face losing Abbey. There has to be some way he can keep her from walking out of his life forever. If a job offer won’t do it then perhaps it’s time for a proposal. Katie Morgan has her future planned. It doesn't include becoming serious about anyone before she achieves her goals, not even her handsome boss. Just because she does not have time to date, doesn't mean her boss shouldn't. Her new mission...to make her boss happy, whether or not he wants to be. Wade McAlester fell in love with Katie the first day she walked into his clinic looking for a job. He hired her, content to settle for friendship until she lives out her dream of becoming a vet. Against his better judgment, Wade allows her to fix him up with a couple of her friends. The dates are disastrous. He can't believe the kind of women Katie seems to think he'd enjoy spending his life with. However, when Wade's old colleague, Dr. Laura Redmond shows up, Katie is rethinking how happy she wants her boss to be, and with whom. Definitely not the gorgeous doctor. On My Own is the second book in the Life With Stef series. In book 1, The 'In' Crowd, Stef learned about forgiveness and friendship. In book 2, On My Own, Stef realizes that being alone for the first time can be scary. When Stephanie's parents trust her to be on her own and even baby-sit for her brother and sister, there's more than shadows spooking her and what about the mysterious phone calls and the man outside? Stephanie finds out that being On My Own isn't that easy. Monika Hell seemed to have it all. She was gorgeous, owned a nice condo, an expensive car, an endless wardrobe, and had a great job as a store manager in the mall. But, she was mean, miserable, and worst of all, hated Christmas. Kidnapped from the mall parking lot on Christmas Eve, her life is turned upside down. Now, on Christmas morning, she finds herself in a freezing alley with nothing but the tattered clothes on her back. With no identification, no money, and no one willing to help, Monika is forced to start all over. Could losing everything she'd worked for all her life lead her to find what's been missing all along? Zach Trewick has a hard choice to make. His family expects him to become a werewolf on the night of the next full moon, whether he likes it or not, and he's got only three days left before time runs out. Scrambling to find a way to stay human, Zach quickly makes a bold plan to run away from home and find his uncle Justin nearly a thousand miles away in Texas, the only person he can think of who might take him in. Stowing away in a septic tank, sleeping in a library, and living in a dog house on a vacant lot are among the adventures he encounters along the way. But the werewolves have no intention of letting him escape so easily. For although he doesn't know it yet, Zach is the Curse-Breaker, the long-foretold boy who can crush the wolf curse forever, and his family will stop at nothing to prevent that. Nominated for the 2010 Texas Lone Star Reading List for excellence in young adult literature and scoring 4.3 stars from 39 reviews on Amazon, Cry for the Moon is the first book in the Last Werewolf Hunter series. The series is suitable for middle-graders and up, since it contains only mild violence and little to no gore. It has more to do with Zach's ultimate choice to become the last werewolf hunter in the world, and to break the Curse forever. Brian Stone's life isn't easy. Abandoned by his father, abused by his alcoholic mother, and mocked by his classmates, his only treasures are his beloved little brother and his old guitar. Then Brian finds a magical amulet in his attic, and things begin to change. Soon he has more power and wealth than he's ever dreamed of, and for a while all seems to be well. But Brian has made a terrible mistake which may cost him everything, and his only hope is to seek out the Fountain at the Heart of the World, wherever that may be. And if he fails, then it will mean the death of every person he loves, and maybe even his own. This book is a tale about the glory of God's love; the life-giving Life, and the Beauty that makes beautiful. ****I have personally read this book, and it is an awesome read! I plan on posting a formal review of it on this blog in the very near future! Love it! In the year 2154, sixteen year old Tycho McGrath is an advanced genetics student at the prestigious John Brooke Academy in Tampa. Life seems fairly dull, until he accidentally discovers that in less than a week, a recently designed bacterium known as the Orion Strain will almost certainly wipe out every human being on earth. Tycho and his friends quickly form a desperate plan to steal an experimental spacecraft and flee to the partially-terraformed Moon, hoping to ride out the plague until it's safe to come home. But the survivors of Earth soon discover that the Moon has its own dangers. Horrific storms, radiation poisoning, and mutant insects all lie in wait, and worst of all, they must soon face the betrayal of one of their own. Will Tycho and the others find their way back to Earth, or will they be trapped forever on the dying Moon? "The 15th Star" has been compared by first readers as a mix of "National Treasure" meets "1776". A light-hearted novella where a self-avowed-worst-cook-ever accepts a challenge to hold a bake sale and cooks up love instead. With “Char” as a nickname, Charlotte Wilson’s cooking skills are more incendiary than culinary. Charlotte is the last person on earth who should run a bake sale. But when her plans of running in a charity marathon are side-lined by a broken foot, her old flame’s suggestion becomes a challenge midst her friend’s simmering doubts. Told in first person point of view by Brian Atwood, who is our main character and works for the FBI. His work involves potential cases of terrorism. Recruited to become personal bodyguard for the President. His faith as a Christian is tested daily working for the President. We follow Brian as the U.S. slowly disintegrates around hm. A beginner’s guide to the guitar from the music shop to writing solid songs with fundamental music theory principles. Includes text, diagrams, explanations, examples, and tips. “Wounded war hero” Hamilton Jessup married celebrity singer Maeve Collinswood without realizing her marriage of convenience proposal would plunge him into a personal and patriotic crisis. Texas faced war with Mexico. A mysterious “Endgame Scenario” set Ham to puzzling Texas’ future. Maeve drew him into a passionate alliance, a deadly confrontation, and a reliance on God he had never imagined. The Bible is a Book of Science Secular Humanism is a Religion of Mythology Antidisestablishmentarianism. As the title of a book it is a little cumbersome, a little intimidating, except that it’s absolutely essential to the discussion of Secular Humanism as America’s Established religion and how we can disestablish it. The surface of Mars is swept by violent storms but the Nehemiah Group lives almost idyllically beneath the surface in “Glop-dropped” parks and sandblasted living quarters. Life support has failed on the balloon ship Sojourner. Joan, bioneural specialist and Anthony Lewis, an engineer and something more, must tread a fine political and diplomatic line to meet the launch window. Jaiyl grew up alone and afraid, feeling the emotions of everyone around her as if they were her own. Being part of a nomadic tribe meant she came in contact with many different people, but was connected to none of them, until she met a family that was different; people who knew God in a way she had never thought possible. She must come to trust God, or doom the world. Thanks for the info! I get free books for my kindle all the time. I love inspirational romances, but I also LOVE a good clean fantasy/scifi or murder mystery. Looking forward to finding new Authors on the blog hop!